June 26, 2012 - The National Transportation Safety Board (NTSB) issued a Safety Alert to warn pilots using in-cockpit FIS-B and Satellite Weather display systems that the NEXRAD "age indicator" can be misleading. The actual NEXRAD data can be as much as 20 minutes older than the age indication on the display in the cockpit. If misinterpreted, this difference in time can present potentially serious safety hazards to aircraft operating in the vicinity of fast-moving and quickly developing weather systems. NEXRAD mosaic imagery depicts weather conditions from multiple ground radar sites. The NEXRAD "age-indicator" on the cockpit display indicates the time that the mosaic image was created, not the time of the actual weather conditions. The NEXRAD image is always older than the actual weather conditions. Weather radar “mosaic” imagery created from Next Generation Radar (NEXRAD) data is available to pilots in the cockpit via the flight information service-broadcast (FIS-B) and private satellite weather service providers. A mosaic image presents radar data from multiple radar ground sites on a single image on the cockpit display. When a mosaic image is updated, it may not contain new information from each ground site. The age indicator associated with the mosaic image on the cockpit display does not show the age of the actual weather conditions as detected by the NEXRAD network. Instead, the age indicator displays the age of the mosaic image created by the service provider. Weather conditions depicted on the mosaic image will ALWAYS be older than the age indicated on the display. Due to latencies inherent in processes used to detect and deliver the NEXRAD data from the ground site to the service provider, as well as the time intervals used for the mosaic-creation process set by the service provider, NEXRAD data can age significantly by the time the mosaic image is created. Although such situations are not believed to be typical, in extreme latency and mosaic-creation scenarios, the actual age of the oldest NEXRAD data in the mosaic can EXCEED the age indication in the cockpit by 15 to 20 minutes. Even small time differences between the age indicator and actual conditions can be important for safety of flight, especially when considering fast-moving weather hazards, quickly developing weather scenarios, and/or fast-moving aircraft. The National Transportation Safety Board (NTSB) has recently investigated two fatal accidents where in-cockpit NEXRAD mosaic imagery was available to pilots operating near quickly developing and fast-moving convective weather. On March 25, 2010, a Eurocopter AS350 B3, N855HW, impacted terrain near Brownsville, Tennessee.2 During the flight, the pilot’s cockpit display indicated that it had received one NEXRAD image roughly halfway through the flight that indicated it was about 1 minute old; however, the weather conditions were actually about 5 minutes old. The image indicated that the severe weather was about 7 miles away from the home base where the pilot was attempting to land, but the severe weather was actually just crossing over the home base at about the time the display received the NEXRAD image. On December 19, 2011, a Piper PA-32-260, N3590T, collided with terrain following an in-flight breakup near Bryan, Texas.3 The pilot had been diverting to avoid weather and had likely received several NEXRAD updates in the minutes leading up to the accident. According to the NEXRAD data the pilot likely would have received, he was flying clear of the precipitation along the edge of the rain. Near the end of the flight, the pilot flew into a section of the developing rain shower. His display should have shown that he still remained clear of the precipitation. The last three NEXRAD updates that the pilot received should have each said that they were 1 minute old at the time they were received; however, the actual weather conditions at the time the images were received in the cockpit were about 6, 7, and almost 8 minutes old, respectively. The general issue of latency with in-cockpit NEXRAD is discussed in pilots’ guides, in industry literature, and on service providers’ websites. However, the NTSB has not found that such guidance contains details about the potential time difference between the age indicator and actual conditions. 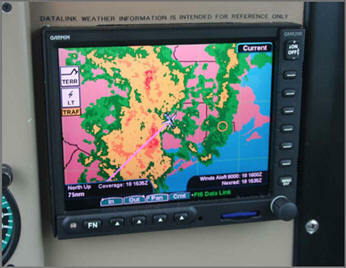 Remember that the in-cockpit NEXRAD display depicts where the weather WAS, not where it IS. The age indicator does not show the age of the actual weather conditions but rather the age of the mosaic image. The actual weather conditions could be up to 15 to 20 minutes OLDER than the age indicated on the display. You should consider this potential delay when using in-cockpit NEXRAD capabilities, as the movement and/or intensification of weather could adversely affect safety of flight. Understand that the common perception of a “5-minute latency” with radar data is not always correct. Get your preflight weather briefing! Having in-cockpit weather capabilities does not circumvent the need for a complete weather briefing before takeoff. Use all appropriate sources of weather information to make in-flight decisions. Let your fellow pilots know about the limitations of in-cockpit NEXRAD.